When I was young I read every scary book imaginable, watched everything I could that scared my socks off, loved Friday the 13th, Nightmare on Elm Street, all Vampire movies, and tried to scare people as often as possible. Then I read something from a well known book called The Bible, it said fear has torment, God told Joshua over and over again, “Do not Fear”, I read if God is on my side of who shall I be afraid?. I read God has not given me a spirit of fear but of power, love, and a sound mind. I began thinking about my dad. All my life my dad was afraid of lightening, going out on big bodies of water on a boat, etc.. These all related to fears he developed from some bad experiences he had when he was young. He grew up during the depression years so he was always afraid he would be broke. As a result of his fear he has been tormented most of his life, terrified of any thunderstorms, refuses to go out on a boat and was always afraid to take chances with his money and career so he has settled for a lot less in life. I started to realize fear does have torment, it does paralyze. I would much rather have love, power, and a sound mind so I can face anything that comes my way. So I said goodbye to fear and scary movies a long time ago. If I do watch one because I am forced, I recognize it for what it is, acting. I usually make fun of the characters or talk about the behind the scenes details of the making of a particular scene. This is usually enough for people to not invite me to watch anymore scary movies with them. The last time I had to watch “The Fly” with a group of teenagers I laughed so much they thought I was nuts. I just look at scary pictures in a completely different light now. I am no longer afraid. Those things aren’t real and they can not hurt me. My mind is focused on much more positive things these days. I truly believe we will become what ever we are listening to and watching with our eyes the most. If we put in fear, we will produce fear. If we put in confidence and faith, and belief that we will succeed, we have those results. You are on the right track! Thanks for your insights. Very well said. I don’t think I’ll be dragged to any scary movies anytime soon. Neither of my daughters like them either. My oldest made us leave in the middle of Despereaux because it got too scary. I like the idea of laughing though them though. When I’m afraid I need to remember Joshua. Thanks for the reminder! Interestingly you and I picked the same topic for the “F” post but approached it from different perspectives. I very much liked your take on the fear that people put themselves through. Being a guy, I’ve always taken grief about my squeamish nature when it comes to horror and gore. I’ve always been more interested in what makes people happy. Nice writing. As a brand new blogger, I’m learning a lot from folks like you. 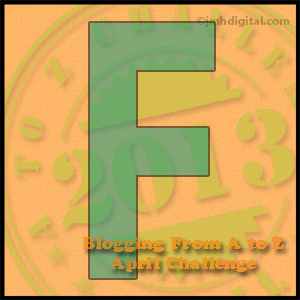 Never blogged before this challenge started six days ago. Peace. Thanks for the comments. I liked your take on Fear too. I really liked the quote about what other people think about you is their business. For me that so hard to remember. Good luck with you blogging! I will definitely put those three on my do not watch list:) I think dragon flies are kind of creepy myself. While I’m not terrified of them, I really wouldn’t want one to land on me! I’m wired the same way. Even when my brain knows there’s nothing to fear, my body disagrees! That exactly how I am. I try to tell myself its not real, but my heart keeps racing. I know what mean. My sister and Dad loved them too. I remember having to tell them to turn the TV down because I could hear the scray music. Previous Previous post: Give Me Some Of That Energy!